Risk prevention necessitates prior awareness of the potential dangers the humanitarian worker may face on the ground. Most websites talk about security problems, but dangers come in a variety of forms. In the short time during which I have served as a humanitarian worker in South Sudan, Kenya, and Sierra Leone, I was confronted with some of these dangers. In this article, I will discuss the potential risk factors and how the humanitarian organization protects your safety and health. I will also talk about what you, yourself, can do to avoid the risks involved in providing developmental aid in Africa. These points may be relevant for other parts of the world as well with slight variations. What is the biggest danger to humanitarian workers in foreign countries? I don't really know what the BIGGEST danger is - let's see. . . in northern Kenya, at the Kakuma Refugee Camp, we were told to wear closed shoes rather than sandals as we walked around the camp compound in order to protect ourselves from snakes and insects. Then some people enthusiastically shared with us the fact that there was such a thing as the "camel spider" aka "sun spider", aka "wind scorpion" aka solifuge.They cheerily told us that this lovely creature jumps up on you and can gobble away half your leg and you can't do anything about it and you die.Closed shoes or even boots up to your knees would not help you in this case. And I didn't run away! I thought about it, you can be sure, but I was stuck in a compound next to a refugee camp about a two-hour drive from the nearest airport. That two hours may as well have been light-years because you cannot travel on the roads alone. More about that later. But maybe you are starting to get the idea - There is no single greatest danger facing the international humanitarian aid worker but several dangerous elements that may be competing for the gold medal..
By the way, when you get reliable facts, you find out that the camel spider bites only in self-defense (and I'm certainly not going to voluntarily pick a fight with one so we're both safe). Furthermore, while the bite can cause quite a bit of pain it will not give you more than a local infection. If you want some good photos (be warned, photos from Iraq show some huge specimens) and funny stories and myths about this creature, have a look at a camel spiders website. I don't know why I didn't look this up while I was still in Kenya; that would have saved me many a skipped heart-beat. Once they were done warning us about the camel spider that may attack us while walking around the compound, someone else told us to check under our pillows and under our beds to make sure there were no black widow spiders waiting to ambush us in the night. How do you put your head on the pillow and allow yourself to drift off into slumber after being told that little piece of wonderful advice? The presence of a thin mosquito net over my bed day and night did not seem to offer any comfort. And then there's the fact that you probably have to leave the safety of your netted bed to go to the toilet in the middle of the night and it is dark and - do you know what you might be stepping close to? Or, onto? A few days after we arrived, someone else who works at the refugee camp told us that she had spotted a huge cobra that had the habit of hanging around on one of the trees. It just so happens that that particular tree was on my way between the dining hall and my room. The guarded compound in which we lived for the duration of our training workshop in Kakuma was supposed to protect us from threat and attack. Apparently the security would not be able to defend against the sneaky creatures that slithered under and through fences or crept over them. In October 2011, two Spaniards working for Doctors without Borders were kidnapped by Al-Shabaab in Dadaab Refugee Camp, the largest refugee camp in the world. Then in June 2012, in retaliation for the Kenyan army attack of insurgents within Somalia, four workers with the Norwegian Refugee Council (NRC) were taken prisoner and their Kenyan driver killed. Dadaab is particularly dangerous, lying close to the Somali-Kenya border and sprawling over a large tract of land. While Kakuma lies far from Somalia and is less dangerous than Dadaab, our hosts were concerned for our safety. They warned us not to go outside the camp into the nearby town on our own. I invited one of the Kenyan camp staff to take me into town and after a very short time she felt insecure and scurried me back to our guarded compound. On another day, I asked my two male colleagues from Israel to go with me into town and we had a much more relaxed time. We asked a young local man to take us to see the market and being with him gave us a sense of security and at the end of the day it gave him a few more Kenyan shillings than he had before. Both in South Sudan and Kenya, there is the rule that everyone has to be back in the compound or hotel by dark. Night-time is characterized by rampant violence - not wild African animals, but violent muggers and drunks. In South Sudan, after dark, there are violent drunken fights in the streets - often with guns - and you would not want to get caught in the cross-fire. A friend who stayed in a hotel near the center of Juba wrote me about how scary it was to hear gun fire and not know if that meant that a war was going on, meaning that he would not be able to leave the hotel even the next morning. If you are there in the rainy season you need to be careful not to be anywhere near rivers when rain is imminent, even if the river beds are dry– there have been incidents of flash floods and drownings. There is a variety of wild and exotic diseases that have been known to break out in South Sudan and other parts of eastern Africa. Before 2010, there were known small-scale epidemics of bird flu, cholera, yellow fever, dengue fever, measles, polio, and ebola. While I was there, ebola threatened to spread as the first cases, which appeared in Uganda, did not present with usual symptoms, thus slowing down medical response. It was relatively easily contained since once the disease was identified proper measures were immediately taken (the Ugandans have experience with this disease). The same could not be said for Western Africa in 2014, however, and Ebola claimed many lives and all but destroyed the economies of three nations. Malaria always has been, and remains, one of the most serious contemporary diseases to affect the continent. There are ways to protect oneself from disease, and humanitarian organizations do everything they can to ensure that their volunteers and staff return home safely and in good health. Vaccinations - Before leaving for Africa, certain vaccinations are essential. The tropical diseases center anyplace in the world will have up-to-date information on what vaccinations are required. At this time, you should have shots protecting you from yellow fever, typhoid, hepatitis A and B, polio booster for adults, measles and mumps if not vaccinated in childhood, meningococcus, and tetanus every 10 years. Prevention of Malaria - The tropical disease center will also recommend a form of anti-malarial medication depending on the length of your stay in Africa. Some pills are taken daily and others weekly, beginning before you leave and continuing after you return. You will also sleep in a bed covered with a mosquito net. Mosquito repellent is also recommended. Water - You never drink water from the taps. The water that is supplied in hotels and in humanitarian worker compounds is safe for washing only. It is also recommended that you do not eat fruit and vegetables that do not have thick skins anyplace other than in the hotel, westernized restaurants or compound dining hall. You cannot be sure that fruit and vegetables are not washed with tap water in less western-oriented establishments. Swimming - River and lake water is often very polluted and carries disease-bearing organisms. Therefore do not jump into that river or pond no matter how hot it is outside and how tempting it may be, even if local people swim there quite freely. You do not know how many of them get infected and sick. Swim only in clean hotel pools. When you work with an NGO (Non Government Organization) or mission (Christian mission), the organization takes care of the health needs of the volunteers and staff. 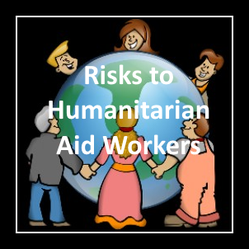 They are concerned about keeping the humanitarian aid worker healthy for altruistic, but also for selfish reasons: a sick aid worker cannot work and costs the organization extra money and wastes the time that a healthy individual would have been able to spend working. Therefore, you can expect that there will be water, whether this water runs from taps, is stored in tanks on the roof, or is collected by locals from the well. This is not drinking water but for washing only. There generally will be adequate water. Food meant for the workers is cooked by locals hired by the organization and prepared in the organization's kitchen. Hygienic conditions are therefore ensured. Beds will be supplied with fresh bedding and and mosquito nets and in some cases, locals will be hired to keep rooms clean. They will often also do the aid workers' personal laundry. Remember, salaries are low in these countries so even small NGOs can afford to hire locals to do these tasks. So far from home, from the cultural environment in which one was raised, working with others who may be very different from the friends we associated with back home - cannot but have a significant impact upon our emotional well-being. One can never truly be prepared for the degrees of poverty and hardship one faces in the humanitarian work situation. Equally important, outlets for stress reduction are limited: You cannot go out to a movie in the evening (or even a matinee in the afternoon). You cannot just leave the compound and go for a walk all on your own after dark. Your internet service may not allow you to view movies. You can generally only interact socially with those with whom you work. That means that you are effectively on a desert island 24/7 with a limited number of social options. For many people, this results in lots of drinking and sexual liaisons that may not have been considered under more normal circumstances. It is important for those about to embark on a humanitarian aid adventure to be aware of the emotional pitfalls and understand that they are going to be on an emotional roller coaster as they adjust to seeing suffering caused by poverty, disease, war and natural disasters. Then they can try to think in advance about the ways they best cope with stress and see which of those can be adapted for the humanitarian work-place. Remarkably, armed soldiers were ordered not to accompany the two-car "convoy" that traveled across Dadaab Refugee Camp in 2012. The reason given was that since there were only two cars, the presence of soldiers may have attracted the attention of Al-Shabaab who may then open fire on them. The October 2011 abduction of two Spanish aid workers led to the initiation of convoys and soldiers, which have become commonplace in Kenya and some parts of South Sudan. Near the Somali border, this is to thwart attack by Somalis intent on revenge against Kenya for infiltrating their territory in search of Al-Shabaab militants. In northern Kenya and in South Sudan, the convoys and armed soldiers accompanying them are for protection against bandits who have begun to attack cars and trucks plying the roads between towns. When our team drove from the airport to the refugee camp and back, we had to wait for enough cars to get together to form a convoy and an army jeep with armed soldiers drove alongside us. You can be sure that the tribal peoples knew exactly what was traveling on the roads even though we could not see anyone around. You just do not take the chance and drive alone. City News Toronto provides an article on the abduction and subsequent rescue of the four international aid workers who were abducted by Al-Shabaab. Their Kenyan driver was killed. First of all, don't tell them about camel spiders, black widow spiders, snakes, malaria, flash floods, abductions or hearing gunfire at night on the other side of the fence that separates you from the rest of the country. That is something you can share after you return from your last period of work overseas. If there WAS an abduction somewhere (even on the other side of the globe) and their legitimate fear (and yours) is aroused, tell them about how the security measures were blatantly ignored and that's what made the kidnapping possible. Tell them that your organization is much more disciplined than that. Do tell them that you got all your shots and are taking your malaria pills religiously and only drink bottled water - you are, aren't you? If you did not get all your shots and if you are not taking your malaria pills and if you are drinking the water from taps, then you deserve what you get! Do tell folks back home about the security arrangements - driving in convoys from town to town with armed soldiers accompanying you, being back in the locked and guarded camp or hotel compound by nightfall until sunrise, etc. And write them about your marvelous adventures, what you are learning about other cultures and funny stories. They will be so happy for you. Did I Scare You Off or Are You Still Game? Would you be willing to risk these dangers, prepare for them, and engage in humanitarian aid work in developing countries? If I haven't scared you off, you can see if you would like to do this kind of work by clicking on: What does a Humanitarian Aid Worker Do?